I know, I know… summer is supposed to be the time when you throw the schedule out the window. But here’s the thing: if you have no plan for your summer days, your summer days will slip by with nothing to show for them. And before you know it, summer will be gone! 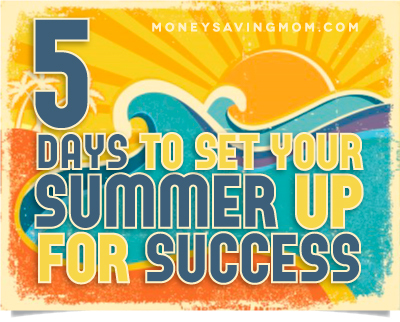 In addition, without a plan for the summer, you’ll likely feel like your life is chaotic, disorganized, and out of control. That’s why you need a plan. 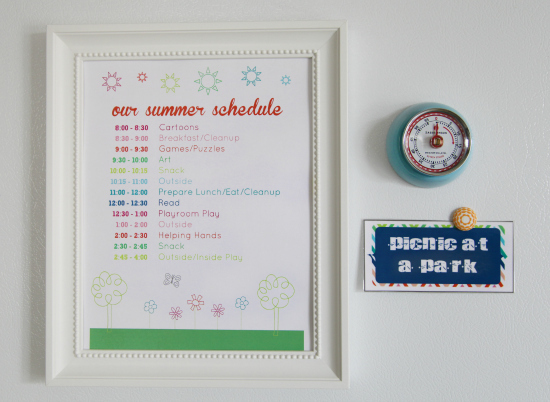 I’m a big fan of a routine instead of a rigid schedule — especially in the summer. A routine allows you to have a plan and some order, but it doesn’t become a straightjacket with very little wiggle room for spontaneous fun. 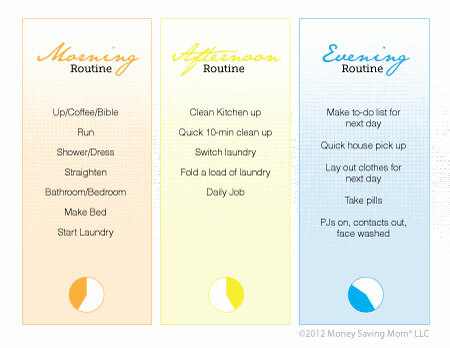 Free printable and customizable Morning, Afternoon, and Evening Routine cards. A routine is just that, a routine. It is not a spreadsheet with every 15 minutes of the day mapped out. And it doesn’t even need to have times if you find that works better. If you have no routine at all right now, start out small — with just 3-5 things that you do every morning when you get up. Focus on these 3-5 things and do them every single morning for 3-4 weeks until you really feel like you are cementing the habit. Don’t add new things to your routine until you’ve got a solid morning routine going. It’s better to start little by little and stick with it than to try to overhaul your life overnight and crash and burn! For more step-by-step help, read my series on How to Develop a Routine That Works — And Stick With It! It’s fun to have some variety in your week and theme days are the perfect way to pull this off! Basically, this just means that each day of the week you have a different focus or project. I’d recommend making sure you have a two or three hour time blocked off in your day for the daily theme. Don’t just try to squeeze it into your busy day somewhere — as that’s just setting yourself up for frustrating and feelings of failure! To give you an example, I thought I’d share our summer routine. We’re doing swimming lessons at the swim club all summer in the mornings instead of our usual homeschooling time. Then, we’re just having a short homeschool time when we get home. This will allow us to (hopefully) continue working on learning throughout the summer but will provide a nice change of pace. Do you typically have a routine during the summer months? Why or why not? I am a teacher, so in the summer I am a SAHM. My schedule has three parts 1) I have a list of “musts” for each day. My mom calls it the “day’s foundation.” I try to get most of it done in the morning–like a farmer gets the chores done so she can get to work. 2)I have an outline for the week of what I want to get done each day — cleaning, cooking, library day, etc. and 3) I have an on going “to do” list of things I need to do, people to call, things to fix, events to prepare for and etc. It helps to have a schedule as well as goals in the summer. I would love to know what types of curriculum you use for homeschooling. Thanks! We use My Father’s World for our core curriculum (we’re doing Creation to the Greeks for the girls and Kindergarten for Silas this coming year) and we supplement with a variety of other books/resources, depending upon the child and year. We took Crystal advice for homeschooling and will be starting MFW this fall with my 2nd grader! we will be doing adventures. I just received the program and love it so far! We have been so out of routine for the last year! My hubby is deployed and we have had health issues and I had a hysterectomy… too many things! So I am looking forward to some semblance of order soon.. I hope to have him back in the next month! BUT, it won’t necessarily bring routine right away. I really like your suggestions because I feel they are usable with an iffy schedule, which is what our’s will be 🙂 Thank you! Thankful for your husband’s service!!! We do. It is a bit less “time oriented” than yours but…I get up somewhere between 5 and 6 and I let the kids sleep until 9:30 . In that time period I have my devotions and blog time and sometimes meet friends to exercise. After the children are up they get started with school (we do just 2 hours worth a day in summer) except for the mornings when one child works out with me, my eldest runs one morning with me and my middle child bike rides one morning with me on those mornings that child starts their school later. We have lunch around noon, and then the afternoon is pretty much free time, I might plan an event or I might not. I start getting dinner ready at 5 and we eat at 6. In the evening I might take a walk with the hubby or a bike ride with the youngest child or play a board game with her, or I might knit on my own. I generally read from 7:30 to 8:30 then head up to bed for devotions and some more reading before falling asleep. The children all stay up later than me! (remember the oldest is 17) with bedtimes of 10, 10:30 and 11. Somewhere in that day they enjoy 1 hour of screen time and we all do daily chores. I love the idea of the routine days. Of course, I also love the idea of summer. 🙂 I never really thought of making summer different from the rest of the year before, since I don’t have kids yet. It does sound nice though. She suggests only 20 minutes a day. I thought her list was creative as I was wanting to still do some learning with the kids this summer. How do you get your kids to sleep till 8:30. Mine are up by 5:30 no matter what we do! I have tried moving bedtime back to 8:30, but wake up times are still unpredictable. At least it’s 6-7 am instead of 5 am which we dragged through a couple of years ago! I can’t imagine 3.5 hours of time all to myself, but I am now motivated to set the alarm earlier for maybe 1 hour of glorious time! They do have later bedtimes than many kids (usually somewhere around 9-9:30 p.m.) because that’s what works better for my husband’s schedule. And we’ve always let them sleep in later as a result as I want to make sure that they get plenty of sleep. 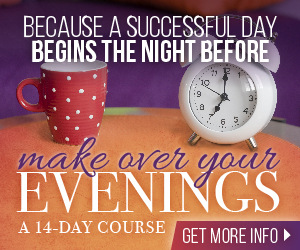 Homeschooling gives us a lot more flexibility with wake-up times than many families have. I am so amazed and impressed by all of you moms who get your kids out the door by 7 a.m. or so during the school year! My kids are also on a later schedule and I’ve debated whether I need to get them on an earlier schedule or not. We also homeschool, but we do have one day each week when we need to be up early and out the door before 8. It can be a hard morning. I’ve wondered if I need to get them up just so we don’t create bad habits for the rest of life of staying up too late and sleeping in too late. Mine are up early, too–about the same time. My mother says I used to get up at 4 am and jump out of my crib every morning, so I am thankful that they don’t get up that early! This is similar to what i do with my youngest while the other 2 are at state school. In the holidays i need to be more ‘fun’ and less ‘inflexible’!! This sounds similar to our summer. I keep 4 grandkids, ages 4 to 11. We sit down each week to plan for the next week. Each kid get to pick meals, movies, games and crafts we will do. They help with meal prep also. We spend about 1/2-1 hour on school work each morning after breakfast. I work full-time so the summer routine is leaving the children a list of their day’s schedule to follow on their own which they are great about doing. They are responsible for their activities/chores/sports practice/free time at age 14, 9 and 7. Wow! I’m impressed! You are doing a great job as a mom! Some routine is good for any days I think. Last summer we did themed we mini “camps” (cooking, science, etc.) for our kids at home instead of themed days. It was fun and even though my guys are still little, we all learned a lot and had a lot of fun. Crystal, what do you do during swim lessons? Do you stay or go home, run errands, etc. Are you still having 1-2 days at home per week? Our summer will be short since we’ll start schooling again on July 8th but we’ll continue with park time, swimming and all other summer fun. This month we’re also attending VBS and one week of sleepaway camp with plenty of playdates mixed in. Our general routine is I wake about 6 am for my quiet time and coffee, daughter up about 8 am., reading aloud and devotions with breakfast, organizing/chores in the morning then outside activity/lunch till about 2 pm. Then I start my work day (I work from home) till dinnertime. During the afternoons, my 8 year old will do 30 minutes of reading, 1 hour of play or rest time in her room, 1 hour of tv time or activities with dad and free time. Family time is 6 pm to 8:30. Daughter storytime/bedtime at 8:30 and I will finish up any work I have at that point. I try to be in bed between 10 and 11 pm. I stay at the swim club during lessons to watch and cheer. And I usually get a little reading/blogging done, too. Since we’re doing swim lessons Mon-Thurs all summer and Fri-Sun we usually have other activities planned, we probably won’t be able to stick to our normal “Stay home at least 2-3 days per week” mantra. But we decided it was okay for the summer because we’re having a more relaxed school schedule. We did something similar last summer and it was a nice change of pace! The theme days is a cute idea. I’ve found in the past two weeks that it has worked really well for us to do an outing in the morning 4 days and have one morning at home. This has helped break up the day better and creates less room for sibling squabbles. I love these pretty printables! We’re still homeschooling into the summer – we will stop some time in July. Our routine helps us stay grounded, whether we are doing school or not. On the days that we “let it slide,” I end up in my PJs at 11am and I’ve done nothing – I hate that feeling! I just posted about our routine. I really like the routine cards. We get into problems around here if I try to make a rigid schedule and to be honest I can’t keep that mess up either!! But, my boys really HAVE to have some kind of routine so the card idea should keep us both ‘hangin loose’ and on track at the same time. Plus they can each post their very own personalized version on their bedroom doors-always a bonus to get to use the sticky tacky stuff!! We have a kind of loose schedule for the summer. Each day there is a certain amount of TV time allowed (and when they have TV time, I have computer time), each day there are standard tasks to accomplish and each day has a specific chore. Then each day we work on our memory verse, do some reading/writing/math (just to keep up skills during the summer, I’m not a homeschooler so this is very loosely done). We have a quiet time/nap time after lunch every day (neither of my kids really nap anymore but I still really need a quiet time). Tues-Wed-Thurs we are helping with the free lunch program our church does for kids in the community. It’s a cool way for my kids to serve each other and also see some friends. We live way out in the country so I like that they get this time with other kids during the week. I also wrote a summer bucket list with all kinds of “I’m bored” activities. Some things that are projects for us to do together, some that are things for them to do on their own. 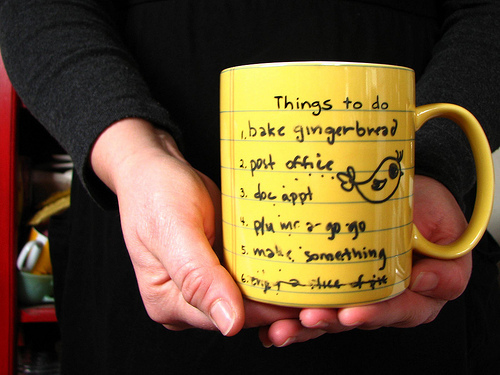 Some are things to do around the house, some are places to go. The kids have been eyeing the list and have been inspired with their own ideas because of the list. I make a schedule and list of things to do so that we don’t mope around all summer, wasting time. Plus, there are just so many things to see and do that we don’t get to do throughout the year. I’ve never really had a summer schedule or routine. However, your statement “But here’s the thing: if you have no plan for your summer days, your summer days will slip by with nothing to show for them” OH this hit me like a ton of bricks. I tell them we’re gonna do such and such this summer…then I don’t get around to it because “I did not plan for it” then before you know they’re going back to school and I’ll hear..but you said XYZ and we didn’t do it. OUCH!!!! And I’ll respond…well, we just ran out of time…NOT TRUE!!! It was my lack of planning. I am sitting down and sceduling activities this summer as soon as I post this. Gonna start with one “go see it” every 2 weeks. Whether it’s a museum, zoo, whatever…Im putting it on the calandar today. Also gonna try the daily suggestions and add in Emily’s suggestion with the learning schedule. I have a few who would really benefit with some math and/or spelling help. So maybe I’ll center one day with games/activites (like cooking) that involve using math and another with games or activites that involve spelling, even writing letters can work. IF they don’t realize it’s “learning” related they won’t balk at it. Thank you soooo much for this article and that ONE statement. Can you say “wake up call! !” Also it won’t be so structured that I can’t follow thru on it. Thank you, thank you, thank you!!!! You are so very welcome! And here’s to an amazingly successful and intentional summer for you and your family! We have set times for tv and we do some homeschooling over the summer but not as much as during the school year. I do lots of gardening and canning so the kids help me out. I also try to have some fun activities a few times a week for the kids to do with me. I like the idea of theme days. then playground or pool until dinnertime (and daddy gets home!). I am a big fan of routines! My boys are a bit older — 12, 12, and 7 — so our schedule looks pretty different, but I like to have a general “plan” for each week. Each of the kids set a “personal” goal — one wants to really get the multiplication table down, another wants to read 50 books over the summer. I love this!! We included places we want to go, camping trips with “old” friends, and trying some restaurants. We also belong to our neighborhood pool, and the older kids can go on their own. We’re usually there most days for the better part of the afternoon / evening. In the end, summer unfolds. I have a white board that I make a list on for every day that includes chores for everyone. They need to finish those chores before noon every day…or before they go to a friend’s house to play. I love summer!! I try to hold my plans loosely as the kids get older and make their own plans, but letting them have a say in the planning and brainstorming = lots of fun, successful outings. And if we’re doing something that isn’t someone’s favorite thing, they know that it will be there turn soon! We’re also a Dave Ramsey family, and we plan to spend more money in the summer. We include extra in the cash envelopes for eating out and entertainment, and because we do have to say no to so many things throughout the year, my kids really appreciate being able to go out to eat or buy a museum membership, or whatever. We also decide as a family how to spend the entertainment money, and it’s always interesting to see what they think. Sometimes I want to splurge, and everyone else wants to pack peanut butter sandwiches and be able to see a movie later in the week. I’m good with that! Especially since they’re old enough to pack the lunches! Summer is pretty much like the rest of the year for me. Since my kids are grown and out of the home, and I work part-time hours that fluctuate, a strict schedule is kind of hard and actually not as necessary, since I am basically planning for myself! However, I decided to work on a few goals that are my “Summer Goals” just for fun and as a motivation. 1. Work on organizing my recipe cards. 2. Work on organizing family pictures. 3. Keep up with my coupons. 4. Read at least one book each month. 5. Ride stationary bike every day and increase time each week. 6.Walk every morning early before it gets too hot. 7. Keep taking pictures of creation/ nature. 8. Work on my prayer notebook. My husband and I have really been slack in doing things together and I am also going to try to come up with frugal things that we can do as a couple once a week, and make some suggestions and let him lead in the decision of what to do. So even though this post was written more for moms with kids, etc. it helped me to set some goals. Thanks! I love this and I’m so happy it inspired you! My children finish school (they go to a local primary school that is brilliant in our village) in 6 weeks time (uk). I really want to make the most of this summer and not just let it pass in a blur of household jobs and no quality time with the kids. I am a routine – addict. I find it hard to just go with the flow so usually spend the morning doing something with the children. This Summer i am aiming to do more craft and cooking activities with the kids. Any inspiration would be apprecicated! Hi! Thanks for the printable! We are in to Day #2 of summer and my original plans were to give the kids a break from learning for 1-2 weeks and then the beginning of June work on reading & math skills. After a day of whining, complaining & “don’t look at me” from the 4 & 7 1/2 year olds I informed the kids we are going to review rules & start a schedule tomorrow. I’ve already printed and filled out my schedule – thanks for making it so much easier! I spend a late evening near the end of May building calendars of activities going on in our town for the summer. Almost all are free (library story times, crafts at the park, movie night by the river, concerts, MOPS play dates) and then I throw in a paid activity every other week (pool, children’s museum, zoo). I email it out to our friends and we usually end up with someone that we know at the various activities. We don’t vacation until the Fall each year, so it makes the kids have different activities to look forward to. We are just about done our homeschool here in a couple of days. And so I’m looking to have some kind of plan in place for the summer for my family. It sounds bad to say it but I have never ever worry about it in the past. But I’m growing and learning! So thank you for sharing your tips and ideas! By the way I love your blog!